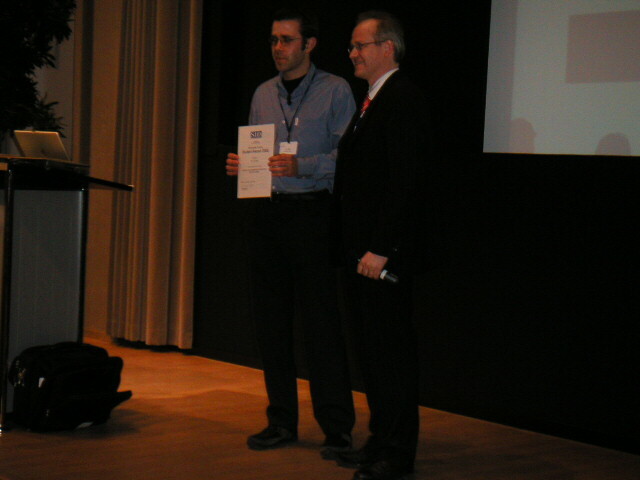 for his thesis “Design and Fabrication of a Tunable Artificial Iris”. The paper “Low Power Wireless Sensor Network for Building Monitoring” was one of the 25 most downloaded Sensors Journal papers in the months of january, february, and march, 2014. Low power wireless sensor network for building monitoring. IEEE SENSORS JOURNAL. Vol. 13. 2013. Tom Torfs, Tom Sterken, Steven Brebels, Juan Santana, Richard van den Hoven, Vincent Spiering, Nicolas Bertsch, Davide Trapani and Daniele Zonta. 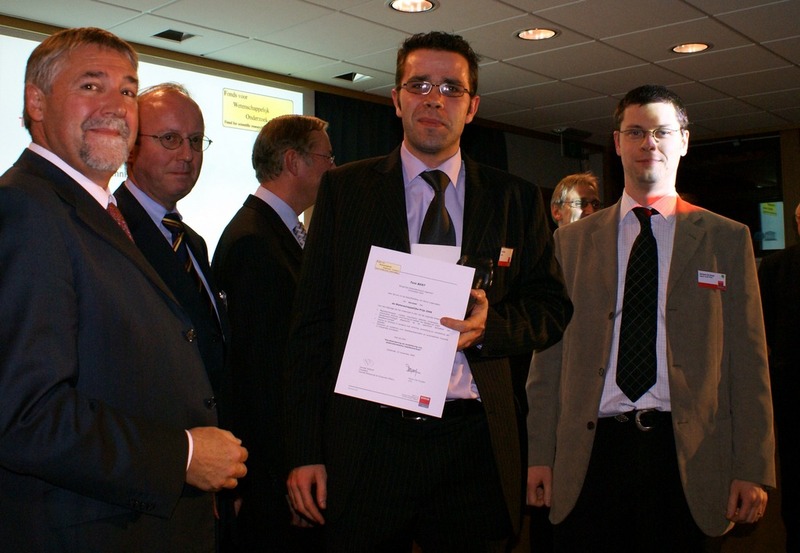 Herbert De Smet en Jelle De Smet were nominated for "Strafste Gentenaar" in the category Academics. More information (in dutch) can be found on the website of the organising newspaper : Het Nieuwsblad - Strafste Gentenaar. 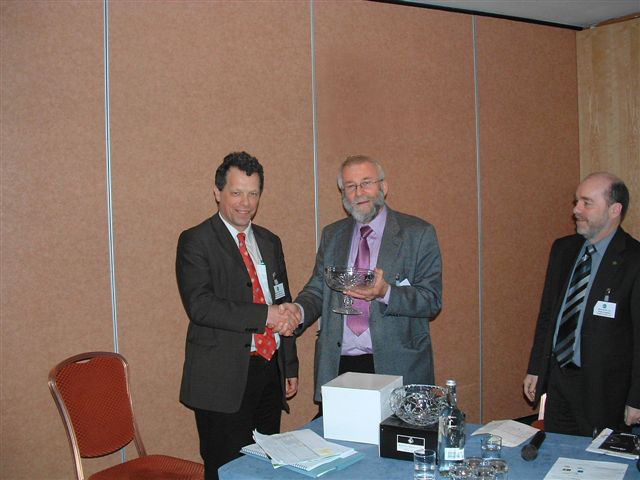 for his work on “The quest for a Liquid Crystal based Contact Lens Display” at the SID-ME spring meeting 2012. See the SID-ME newsletter 29 2012.
for their design of a fully-integrated PWM-driven H-Bridge with IGBTs for the speed control of DC-motors. "Elastic electronics : first functional circuits realised": Fabrice Axisa, Pieter Bauwens, Frederick Bossuyt, Dominique Brosteaux, Nadine Carchon, Wim Christiaens, Dieter Cuypers, Johan De Baets, Lieven Degrendele, Eva De Leersnyder, Kristof Dhaenens, Jonathan Govaerts, Benoit Huyghe, Bart Reekmans, André Van Calster, Bjorn Vandecasteele, Jan Vanfleteren, Steven Van Put, Geert Van Steenberge, Thomas Vervust. "Stretchable Conductor Technology for Elastic Electronic Systems": Johan De Baets, Fabrice Axisa, Dominique Brosteaux, Mario Gonzalez, Thomas Löher, Dion Manessis, Ralf Heinrich, Benno Schmied, Andreas Ostmann, Jan Vanfleteren. "Elastic and Conformable Electronic Circuits Using MID in Polymer": Fabrice Axisa, D.Brosteaux, E. De Leersnyder, F. Bossuyt, M. Gonzalez, M. Vanden Bulcke, J. Vanfleteren. See this off-line pdf version. The Scientific Prize Barco/F.W.O. 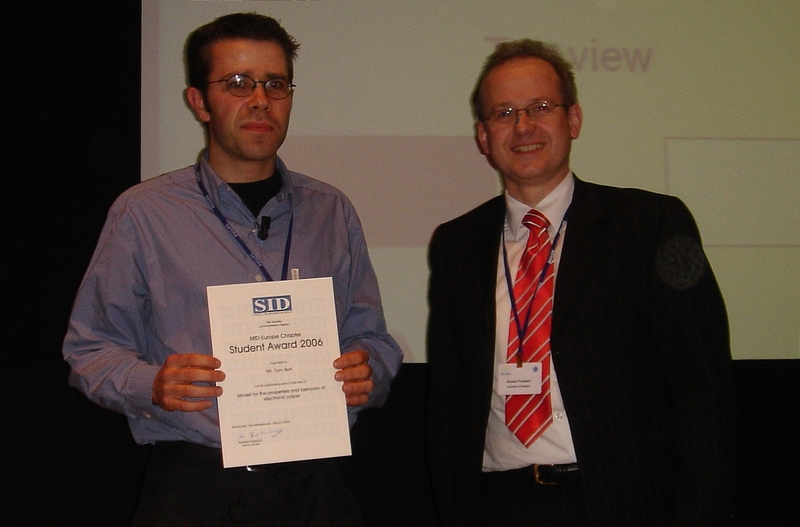 2006 was awarded to Tom Bert for his doctoral thesis "Characterisation and modeling of electrophoretic image displays" (Promotor: Prof. Herbert De Smet). This prize amounts to 5'000 Euro. "Model for the properties and behaviour of electronic paper" by Tom Bert, Vincent Degezelle, Geert Van Steenberge, Steven Van Put, Peter Geerinck & Herbert De Smet. "An O/E Measurement Probe Based on an Optics-Enabled MCM-D Motherboard Technology" by Herbert De Pauw, Johan De Baets, Jan Vanfleteren, André Van Calster. uitgevoerd onder leiding van Prof. André Van Calster en ir. Geert Van Doorselaer. "Highlights of DACTEL Project: Development of Adhesive Technologies for Dedicated Electronic Applications", by Jan Vanfleteren, Alfons Vervaet, Andre Van Calster. 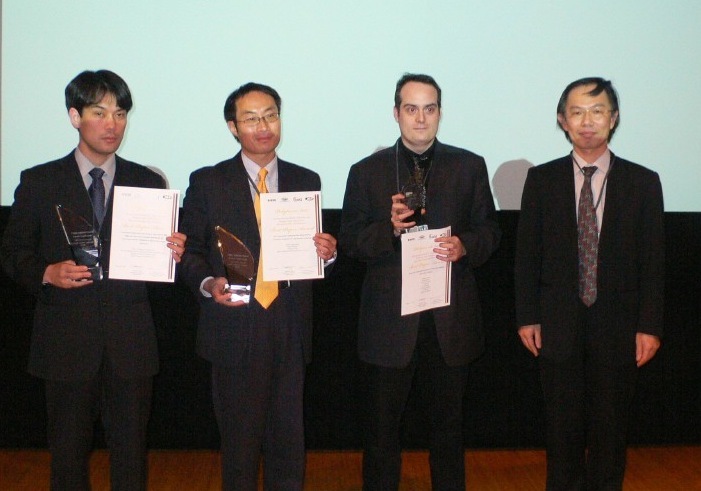 This prize is annually awarded to the author of an original contribution in the field of display technology. It was received by former member I. De Rycke. 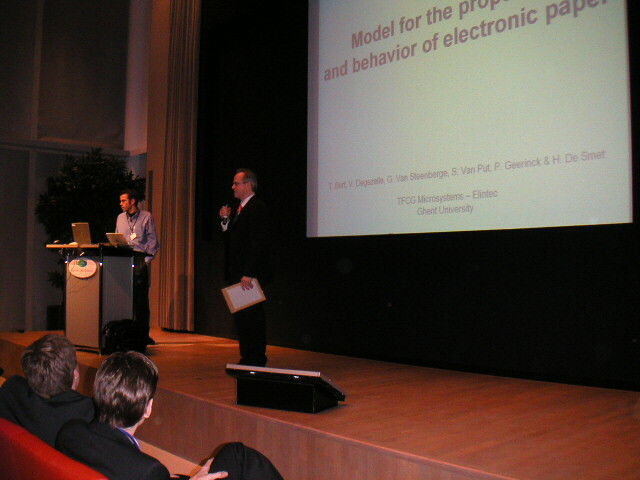 "Design of a Prototype Active Matrix CdSe addressed El Display", by J. Vanfleteren, J. De Baets, I. De Rycke, H. De Smet, J. Doutreloigne, A. 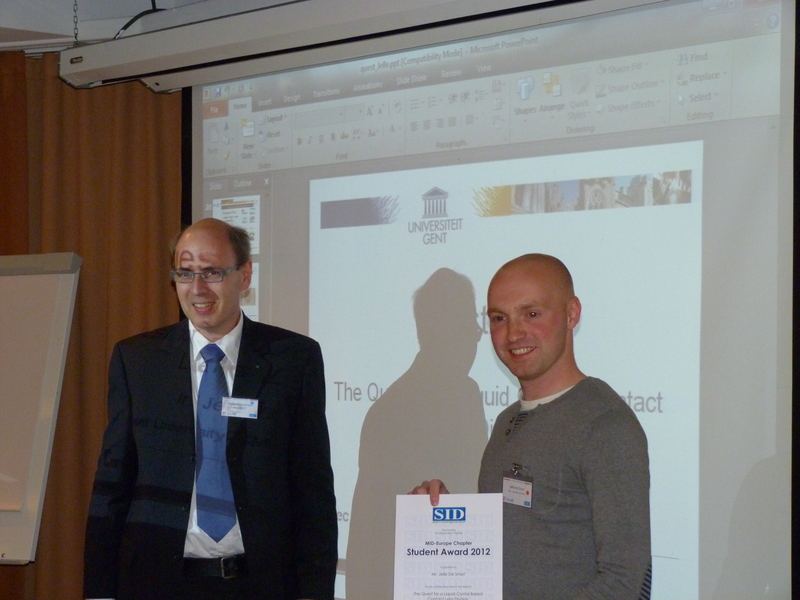 Van Calster, P. De Visschere, K. Sallmen and R. Graeffe, has won the best poster award of the Eurodisplay conference. "On the Poly-CdSe Thin Film Transistor Technology", by A. Van Calster, J. De Baets, I. 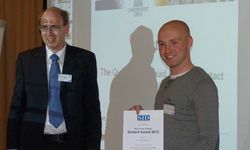 De Rycke, H. De Smet, J. Doutreloigne and J. Vanfleteren, has been granted an "outstanding paper award" at the Japan Display conference. This prize rewards an original contribution to the technology of visual communication between man and machine. It was granted to A. Van Calster and J. Vanfleteren.